Themas ("Das den Kranich reitende Kind") findet sich bei den Weichfluegel-Drachen. The crane is a symbol for longevity, wisdom, old age, and the relationship between father and son.The child holds a RuYi within its hands. visions of all kinds of immortals. 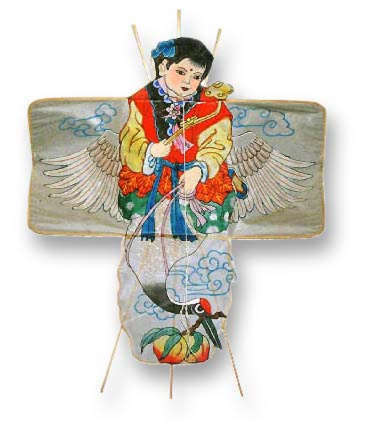 Another variation of this topic (The Crane Riding Child") is to be found within the section of Softwing Kites.